Hap and Leonard TV show renewed for a second season on SundanceTV (James Minchin/Sundance Film Holdings LLC). Star James Purefoy has announced his Hap and Leonard TV show has been renewed for a second season. The renewal does not come as a surprise. Last month, we reported it was expected. SundanceTV has not yet issued an official press release. Hap and Leonard season two is expected to consist of six episodes. Purefoy stars as Hap Collins, in this comic “swamp noir” series. Hap is an East Texas white boy with a weakness for Southern women. Michael Kenneth Williams also stars as Leonard Pine, his best friend — a gay, black Vietnam vet with a hot temper. The cast also includes Jimmi Simpson, Bill Sage, Pollyanna McIntosh, Neil Sandilands, and Jeff Pope. Hap and Leonard TV series on SundanceTV renewed for second season (Hilary Gayle/Sundance Film Holdings LLC). What do you think? Are you a fan of the Hap and Leonard TV series? Will you watch the second season? 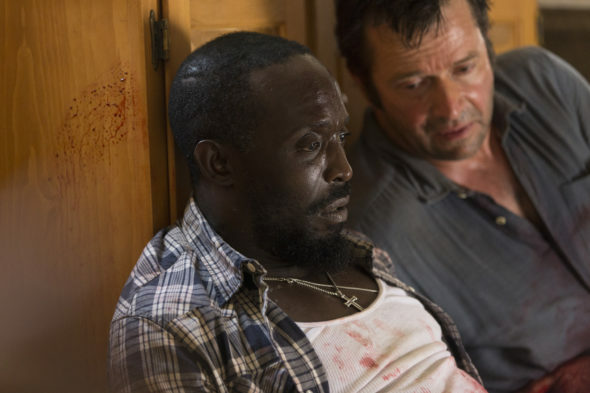 More about: Hap and Leonard, Hap and Leonard: canceled or renewed?